A chic twist on a classic design, this distinctive shower curtain has a simple yet interesting look that will fit a wide array of bathroom d&eacute;cors. Featuring clean stripes and tassel accents along the sides, this unique shower curtain really stands out. Made from a blend of 82-percent cotton and 18-percent polyester, this fabric shower curtain is completely water repellant yet soft to the touch. This dramatic shower curtain measures the standard 72-inches by 72-inches, so it will fit perfectly in most showers, and installation is as simple as putting your shower hooks through the pre-cut grommets, along with your shower curtain liner which is not included. This designer shower curtain is machine washable and easy to care for. Simply wash it in cold water on a gentle cycle and tumble dry on low when needed to keep it looking fresh for years to come. • 72” x 72” • 82% Cotton, 18% polyester • Stripe pattern with tassel accents • Shower liner not included • Machine wash cold on a gentle cycle, tumble dry low • Coordinating items in the Tribal Chic line available" A chic twist on a classic design, this distinctive shower curtain has a simple yet interesting look that will fit a wide array of bathroom décors. 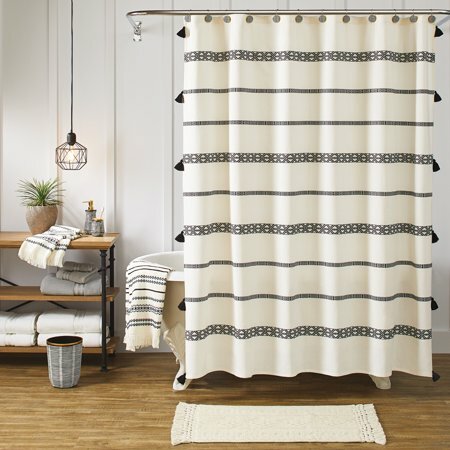 Featuring clean stripes and tassel accents along the sides, this unique shower curtain really stands out. Made from a blend of 82-percent cotton and 18-percent polyester, this fabric shower curtain is completely water repellant yet soft to the touch. This dramatic shower curtain measures the standard 72-inches by 72-inches, so it will fit perfectly in most showers, and installation is as simple as putting your shower hooks through the pre-cut grommets, along with your shower curtain liner which is not included. This designer shower curtain is machine washable and easy to care for. Simply wash it in cold water on a gentle cycle and tumble dry on low when needed to keep it looking fresh for years to come. I absolutely love this shower curtain! I have been looking for actual curtains for my laundry room with tassels, but they are always so expensive. This shower curtain was perfect! I just ordered a second to complete the look. They are a beautiful ivory/cream color with black embroidery. Seriously stunning! Great price and great quality, design is actually embroidered into the curtain! I couldn't be happier. It came in perfect condition, exactly as pictured. I bought set of these and use them as outdoor curtains on my back patio. I love them! I love it! Looks just like the photo. Great quality for the price and it looks beautiful in my bathroom. I love this shower curtain it looks elegant! Great quality and look for the price! Great quality & looks great! Ordered online. I love this shower curtain. But when I took out the package and hung, it had lots of pulled stings (see pic). I will just cut them and keep up. It's in a guest bath that doesn't get used much, if it was used daily I would exchange. Very Pretty! I saw this shower curtain in the store and loved it. The packaging shows the tassels along the side and bottom of the shower curtain. It does not has the black tassels along the bottom, just FYI. Online pictures display the correct look. Will be returning but really pretty.